Palestine’s Ministry of Local Government (MOLG) oversees municipalities and village councils in the West Bank and the Gaza Strip. It needed a way to effectively manage urban development in these two unconnected pieces of land. A team developed an enterprise GIS that disseminates real-time spatial information from one central location, reducing the time, cost, and manpower needed to collect and analyze this data. GeoMOLG, pictured here, is a straightforward web mapping application that has helped Palestine's Ministry of Local Government collect data about land use and management and connect data with other government departments, nongovernmental organizations, and academic institutions. One of the ministry’s key responsibilities is approving urban master plans in all of Palestine’s cities, towns, and villages. Urban master plans assign land usage rights (whether a property will be residential, commercial, or agricultural, for example) and classify road networks (their placement, width, and slope) to inform planning and construction regulations. Given that the West Bank and the Gaza Strip are relatively small in size at around 3,700 square miles (6,000 square kilometers) with a small population of about 4 million people, MOLG wanted to be able to house all urban planning information in one database and have its Spatial Information Systems Department edit and manage data in real time at the local, regional, and national levels. MOLG also wanted to provide a user-friendly public portal whereby other government officials and the general public could easily access planning information for any location in the West Bank and the Gaza Strip. After studying its requirements, MOLG decided that a robust web mapping application would best serve its needs. With full funding from the German Agency for International Cooperation (known by its German acronym GIZ) and development assistance from GISTEC, the official Esri distributor in the United Arab Emirates, a GIS team within the ministry created the Integrated Spatial Information System of the Palestine Ministry of Local Government, or GeoMOLG. While the end product is a straightforward web mapping application, the data manipulation efforts required to support the team’s ongoing operations are both extensive and critical. To keep within budget constraints, substantial efforts were made to reduce development and define areas of efficiency. The team used CAD software to draw out land usage and road network features and implemented Safe Software’s FME Desktop to convert hatches to polygon feature classes. All the urban master plans are stored in a single enterprise geodatabase on Microsoft’s SQL Server to enable multiuser editing. The feature classes in the geodatabase are added to a map document in ArcGIS for Desktop and published using ArcGIS for Server, which makes sharing easy. End users then interact with and manipulate the spatial data using web viewers powered by Latitude Geographics’ Geocortex. 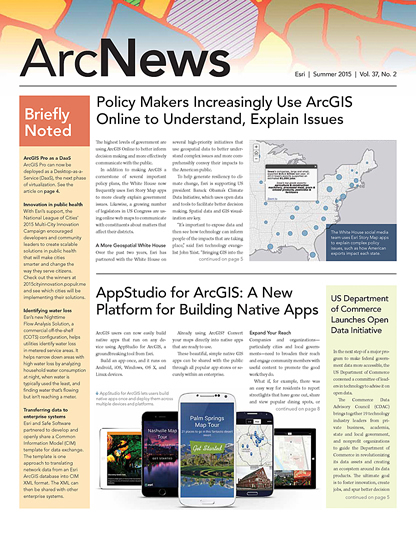 Additionally, field teams use ArcPad to continuously collect data—mostly on public utilities and facility locations—which can be uploaded straight to ArcGIS for Server and reflected on GeoMOLG in real time. 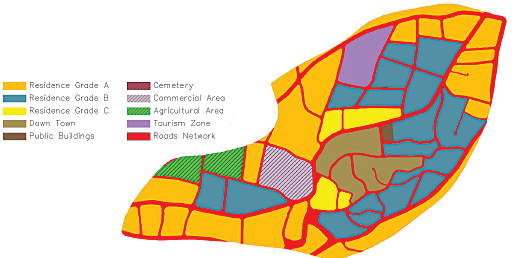 Based on the success of the initial web mapping application, the ministry made additional data available on GeoMOLG beyond urban master plans, including land parcel specifications, agricultural classifications, local authorities’ administrative boundaries, electoral districts, and even aerial photographs. GeoMOLG now allows Palestine's Ministry of Local Government to centrally manage all urban master plans—such as this one for the community of Marda in the West Bank—throughout the West Bank and the Gaza Strip. The ministry also allowed other government institutions to apply for access, which meant that not all the data would come from MOLG and that the end-user base would have varied interests. To manage the first issue, the team ensured that all users uploaded authoritative source data as map services, which maintains a link to the original source and displays this new information almost immediately on GeoMOLG. The team also worked with GISTEC to further customize the types of files users could add directly to the web application. Thus, GeoMOLG became more about connecting data than simply collecting it. With such a large amount of geographic information available in one place, GeoMOLG soon began fostering cross-disciplinary communication and collaboration on an unprecedented scale within the government and with nongovernmental organizations and academic institutions. It quickly became the most important source of spatial data in Palestine. In fact, at the application’s official launch in November 2014, Palestinian Prime Minister Rami Hamdallah stressed the importance of further developing GeoMOLG by incorporating additional data and adding capabilities to expand its reach. GeoMOLG has substantially increased the availability of spatial information and the efficiency of accessing it. By creating one space for users to access many types of spatial data, GeoMOLG has made it easier to make informed, fact-based decisions. It is no surprise, then, that this tool has become the key to defining strategies and formulating road maps for future development in Palestine. Jamal Numan, who holds a master of science degree in GIS and has a background in civil engineering, is the enterprise spatial information systems expert at the Palestine Ministry of Local Government. He may be contacted at jamaln@molg.pna.ps. Saed Abu Helwa is the technical director and chief technology officer at GISTEC. He has a master of science degree in communications and electronics and a bachelor of science degree in electrical engineering.